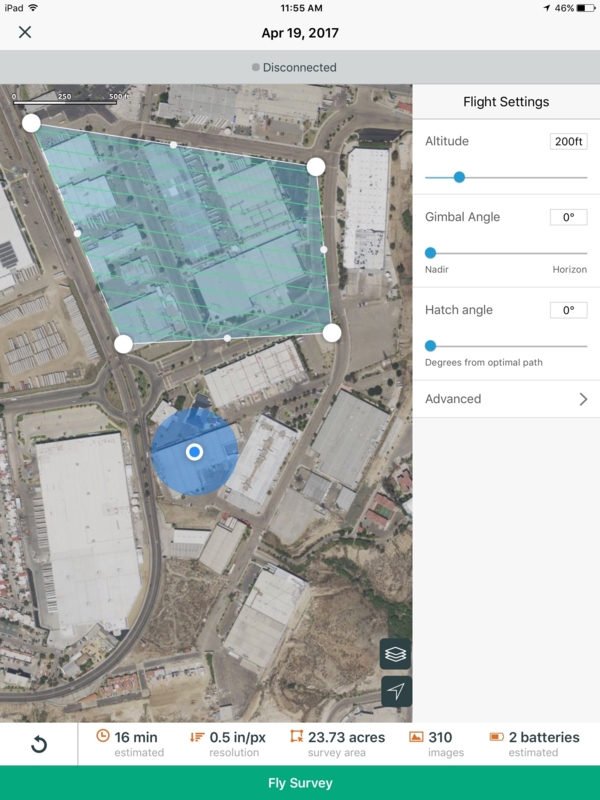 A single battery enables the survey of up to 50 acres, but with Site Scan Field it is possible to split a flight between multiple batteries to survey larger areas. This feature operates automatically without any input from the user. 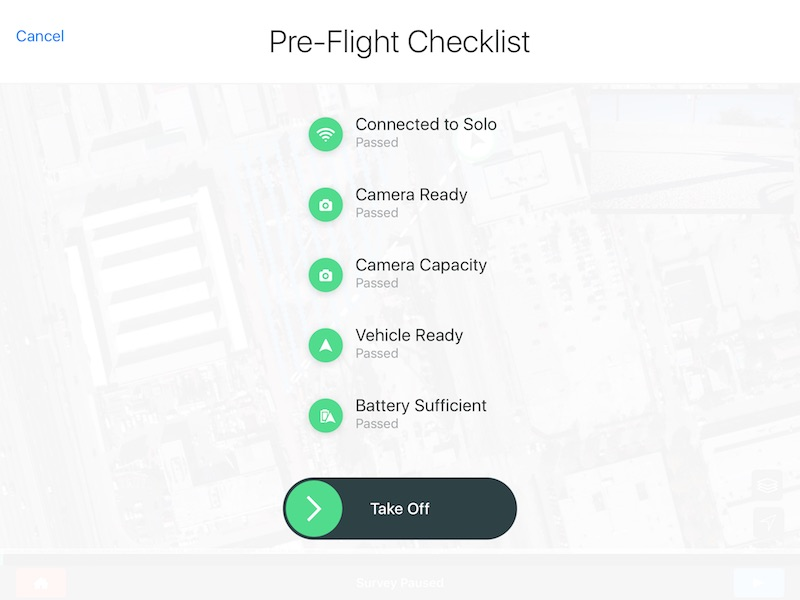 When planning a survey, Site Scan Field approximates the number of fully charged batteries the drone will consume to complete the flight. Here, I planned a a survey that will consume 2 batteries. Take off as normal, note however that the Site Scan Field app checks the battery before flying. 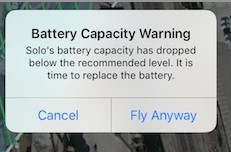 If the battery is not fully charged you will see the following warning giving you an opportunity to swap out the battery for a fully charged one. The drone will then fly the prescribed path capturing images along the way. Upon landing, the drone will prompt for a battery change. Change the battery or end survey if you would not like to capture the remainder of the photos. 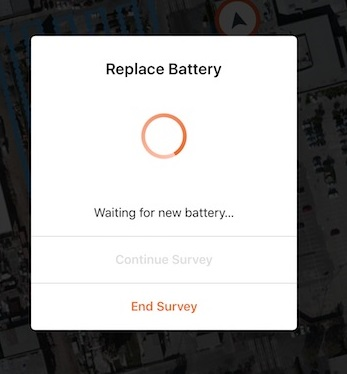 When you replace the battery and wait for the drone to reconnect, Site Scan Field will allow you to continue the survey. Note that this behavior occurs whether the survey was ended prematurely by the user or the battery. 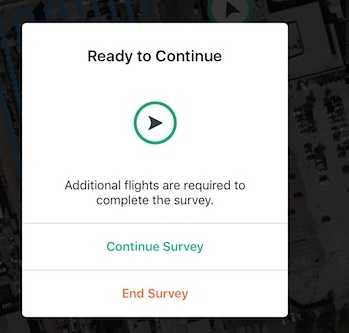 After tapping “Continue Survey”, simply swipe “Take Off” and the drone will continue autonomously capturing your aerial data. To process the images you can visit the following article for step by step instructions within the “Process Flight” section.